The Solution below shows the Eb blues scale, on the piano, treble clef and bass clef. This step shows the E-flat blues scale on the piano, treble clef and bass clef. There are 6 blues scale notes plus the octave of the tonic note - a total of 7 notes. The E-flat blues scale has 5 flats. This step describes the Eb major scale , which is necessary to build the blues scale in a later step. 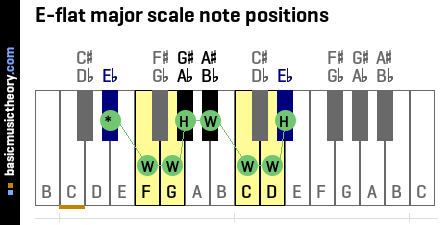 To understand why these sharp and flat note names have chosen given the note positions from the previous step, have a look at the Eb major scale. The flattened 5th is the blue note that gives the blues scale its distinctive sound in this key. 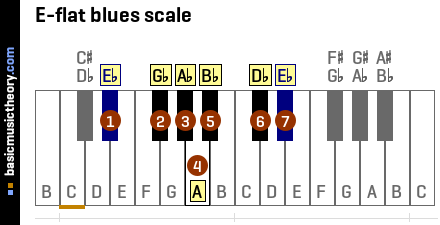 So for this major scale, the 5th note of the major scale is flattened from Bb to A to make the blue note. 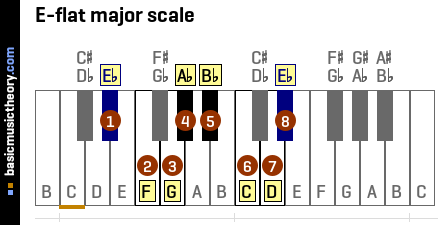 This step shows the Eb natural minor scale scale notes, on which the minor pentatonic scale is based. 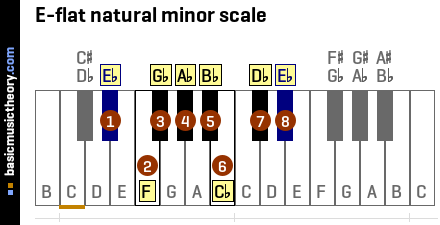 To understand why this scale has these sharp and flat note names, have a look at the Eb natural minor scale. 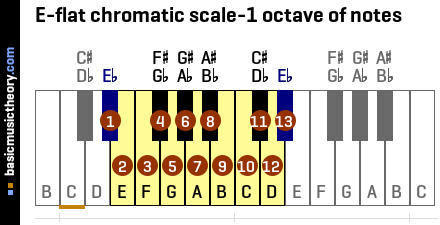 This step shows the Eb minor pentatonic scale scale notes, on which the blues scale is based. To understand why this scale has these sharp and flat note names, have a look at the Eb minor pentatonic scale. To construct the blues scale from the minor pentatonic scale in the previous step, take the 4th note of that scale(note Bb), flatten it, and insert it before the 4th note position of the same scale. This note A is the blue note that gives the blues scale its distinctive sound in this key. Yet another (more complex) way to identify the blue note is to take the Diminished 5th note interval based the tonic note - Eb-dim-5th.